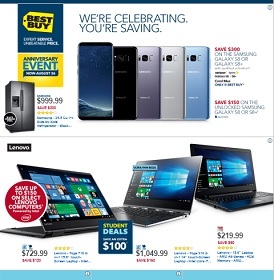 Explore this week Best Buy Ad, valid April 21 – April 27, 2019: $219.99 Lenovo – 15.6″ Laptop – AMD A6-Series – 4GB Memory – AMD Radeon R4 – 500GB Hard Drive; $1,049.99 Lenovo – Yoga 910 2-in-1 14″ Touch-Screen Laptop – Intel Core i7 – 8GB Memory – 256GB Solid State Drive; $729.99 Lenovo – Yoga 710 2-in-1 15.6″ Touch-Screen Laptop – Intel Core i5 – 8GB Memory – 256GB Solid State Drive; $999.99 Samsung – 24.5 Cu. Ft. Side-by-Side Refrigerator; $699.99 Samsung – 58″ Class (57.5″ Diag.) – LED – 2160p – Smart – 4K Ultra HD TV; $1,649.99 Alienware – 17.3″ Laptop – Intel Core i7 – 16GB Memory – NVIDIA GeForce GTX 1070 – 1TB Hard Drive + 128GB Solid State Drive; $349.99 Microsoft – Xbox One S 1TB Battlefield 1 Special Edition Console Bundle with 4K Ultra HD Blu-ray; $179.99 Samsung – Galaxy Tab E – 9.6″ – 16GB; $109.99 Shark – Navigator Bagless Upright Vacuum – Silver; $179.99 LG – 220W Hi-Fi Entertainment System; and more. Find all deals and offers in the latest Best Buy Weekly Ad for your local store.